Trees can provide a lot of benefits to your family and property. 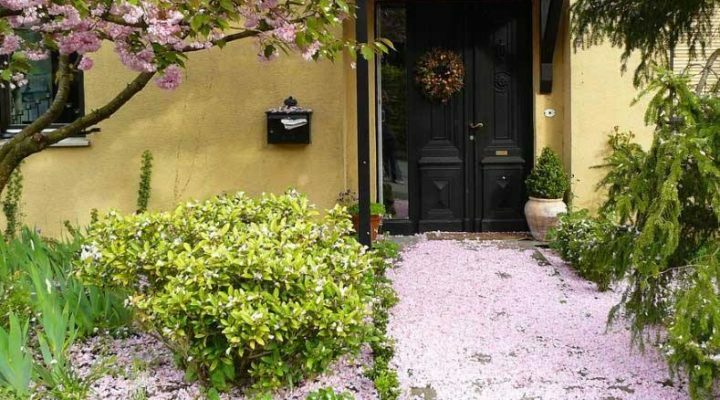 This can improve the overall look of your property and can increase its value over time. Trees are also a good source of shade, perfect for your family’s outdoor activities during warmer months. But because trees grow, you need to trim and prune these regularly. This is one way of ensuring everyone’s safety while around these trees. Plus, trimming and pruning help your trees to grow branches that are suitable for its structural integrity. Simply put, trimming and pruning can drastically influence trees’ growth. Prepare the right tools: First things first: you need to have the right tools before you can start trimming and pruning trees. For starters, you’ll need pruning shears, loppers, pruning saws, hedge shears, and pole pruner. If you’re planning to trim and prune all of your trees on your own over time, consider purchasing these items as your investment. a. If the branches of your trees are thicker than 50 mm or 2 inches, cut a V-shaped mark on the underside of the branch. The mark should be about 300–600 mm from the main branch or the trunk of the tree. Doing this prevents the bark from tearing off once the branch falls. This also ensures that the healthy part of the tree isn’t affected by those that are diseased. b. Cut the branch off beyond the mark you’ve made. c. Use a saw and cut the remainder of the branch. You should cut the branch above where the bark wrinkles (the area where the trunk and the branch join). d. When trimming and pruning trees, it’s important that you maintain a straight cut that is neither too close nor too far from the main branch or trunk of the tree. When you make a cut that’s too close, you’ll only expand the area of the tree’s wound, and you might also remove part of its tissue that could have helped hasten the scarring process. On the other hand, cutting too far will leave the stump susceptible to parasites – something which you don’t want your tree to have! e. If you want to avoid any infection on your trees, cut the affected bark at the edge of the wound using the appropriate tools. A wood chisel or gouge can work well for this purpose. After cutting, smooth the area with sandpaper. Be careful with greeneries near electrical wires: If the trees in your property grow vines or ivy, make sure that these are trimmed away from any electrical wirings. Don’t solely depend on the rubber insulation wrapped around these wires as these could be old or worn. Vines and ivy that come into contact with these bare wires can become a conductor of electricity and can even cause electrocution. Don’t immediately cut your trees once they’re in another property: Trees usually have larger branches. Seeing these kinds of trees in your own property can be pleasing, but when these trees already intrude a neighbor’s property, that’s another story. If your trees are casting too much shade or blocking the neighbor’s view from the inside, don’t immediately trim, prune, or even cut your trees. These circumstances are not grounds for your neighbors to demand that you actually do something with your trees. If you want to trim or prune your trees that are already growing within your neighbor’s property, make sure to ask permission from them. You should have their consent first before working with trees on their property. You should follow their preference even if there’s only a single hanging branch on their property. Call the professionals: If you don’t have the time to prune your trees or you’re not confident of your own output, consider calling professionals for help. Companies like Bellarine Trees offer thinning and pruning services at a reasonable price. Hiring them will save you a lot of time and effort since you’ll no longer have to accomplish this task on your own. Additionally, hiring professionals also give you confidence and peace of mind – your trees are handled by the best in the industry, so there’s no need to worry about anything! Letting your trees grow unattended might seem convenient, but this can have grave consequences in the future. If you want your trees to bring positive benefits and not do the complete opposite, take time to trim and prune them. You don’t have to worry about getting the job done as there are many ways to skin the cat. Look for a technique that you think will suit you. Practice trimming and pruning until these tasks become part of your routine.